This page last revised October 7, 2015. Save 10% off the first payment on monthly and annual shared plans. 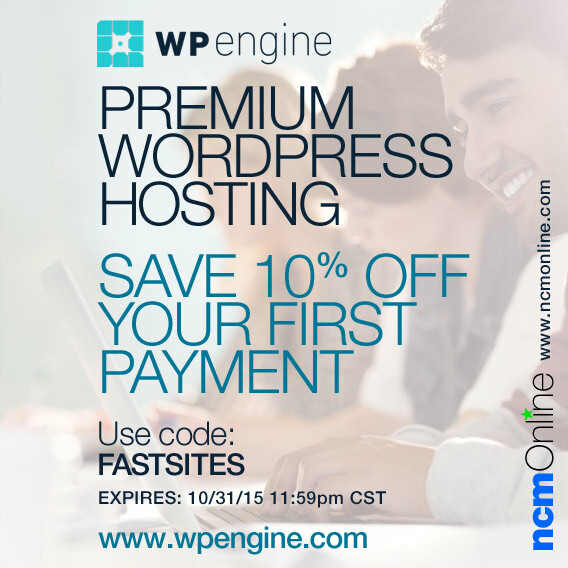 Use promo code FASTSITES in your cart when you order. Stunning speed, powerful security, and best-in-class customer service. Improve conversion rates with a faster site on WP Engine. WordPress isn’t just their platform, it’s their passion. Expires 11:59 PM CST October 31, 2015. Validity: Offer valid only for new customers; does not apply to upgrades or existing customers. Cannot be combined with other offers. Valid only on Personal, Professional, or Business plans. Cannot be combined with other offers. Certain elements of this page: Copyright © 2015 WPEngine Inc. All Rights Reserved.